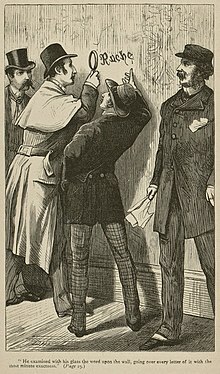 In the mystery story "A Study in Scarlet", detective Sherlock Holmes examines a clue which is later revealed to be an intentional red herring. As an informal fallacy, the red herring falls into a broad class of relevance fallacies. Unlike the straw man, which is premised on a distortion of the other party's position, the red herring is a seemingly plausible, though ultimately irrelevant, diversionary tactic. According to the Oxford English Dictionary, a red herring may be intentional, or unintentional; it is not necessarily a conscious intent to mislead. The expression is mainly used to assert that an argument is not relevant to the issue being discussed. For example, "I think we should make the academic requirements stricter for students. I recommend you support this because we are in a budget crisis, and we do not want our salaries affected." The second sentence, though used to support the first sentence, does not address that topic. In fiction and non-fiction a red herring may be intentionally used by the writer to plant a false clue that leads readers or audiences towards a false conclusion. For example, the character of Bishop Aringarosa in Dan Brown's The Da Vinci Code is presented for most of the novel as if he is at the centre of the church's conspiracies, but is later revealed to have been innocently duped by the true antagonist of the story. The character's name is a loose Italian translation of "red herring" (aringa rosa; rosa actually meaning pink, and very close to rossa, red). Herrings "kippered" by smoking, salting and artificially dyeing until made reddish-brown, i.e., a "red herring". Prior to refrigeration kipper was known for being strongly pungent. In 1807, William Cobbett wrote how he used a kipper to lay a false trail, while training hunting dogs—an apocryphal story that was probably the origin of the idiom. "When I was a boy, we used, in order to draw oft' the harriers from the trail of a hare that we had set down as our own private property, get to her haunt early in the morning, and drag a red-herring, tied to a string, four or five miles over hedges and ditches, across fields and through coppices, till we got to a point, whence we were pretty sure the hunters would not return to the spot where they had thrown off; and, though I would, by no means, be understood, as comparing the editors and proprietors of the London daily press to animals half so sagacious and so faithful as hounds, I cannot help thinking, that, in the case to which we are referring, they must have been misled, at first, by some political deceiver." Prior to 2008, the figurative sense of "red herring" was thought to originate from a supposed technique of training young scent hounds. There are variations of the story, but according to one version, the pungent red herring would be dragged along a trail until a puppy learned to follow the scent. Later, when the dog was being trained to follow the faint odour of a fox or a badger, the trainer would drag a red herring (whose strong scent confuses the animal) perpendicular to the animal's trail to confuse the dog. The dog eventually learned to follow the original scent rather than the stronger scent. A variation of this story is given, without mention of its use in training, in The Macmillan Book of Proverbs, Maxims, and Famous Phrases (1976), with the earliest use cited being from W. F. Butler's Life of Napier, published in 1849. Brewer's Dictionary of Phrase and Fable (1981) gives the full phrase as "Drawing a red herring across the path", an idiom meaning "to divert attention from the main question by some side issue"; here, once again, a "dried, smoked and salted" herring when "drawn across a fox's path destroys the scent and sets the hounds at fault." Another variation of the dog story is given by Robert Hendrickson (1994) who says escaping convicts used the pungent fish to throw off hounds in pursuit. According to a pair of articles by Professor Gerald Cohen and Robert Scott Ross published in Comments on Etymology (2008), supported by etymologist Michael Quinion and accepted by the Oxford English Dictionary, the idiom did not originate from a hunting practice. Ross researched the origin of the story and found the earliest reference to using herrings for training animals was in a tract on horsemanship published in 1697 by Gerland Langbaine. Langbaine recommended a method of training horses (not hounds) by dragging the carcass of a cat or fox so that the horse would be accustomed to following the chaos of a hunting party. He says if a dead animal is not available, a red herring would do as a substitute. This recommendation was misunderstood by Nicholas Cox, published in the notes of another book around the same time, who said it should be used to train hounds (not horses). Either way, the herring was not used to distract the hounds or horses from a trail, rather to guide them along it. The earliest reference to using herring for distracting hounds is an article published on 14 February 1807 by radical journalist William Cobbett in his polemical periodical Political Register. According to Cohen and Ross, and accepted by the OED, this is the origin of the figurative meaning of red herring. In the piece, William Cobbett critiques the English press, which had mistakenly reported Napoleon's defeat. Cobbett recounted that he had once used a red herring to deflect hounds in pursuit of a hare, adding "It was a mere transitory effect of the political red-herring; for, on the Saturday, the scent became as cold as a stone." Quinion concludes: "This story, and [Cobbett's] extended repetition of it in 1833, was enough to get the figurative sense of red herring into the minds of his readers, unfortunately also with the false idea that it came from some real practice of huntsmen." Although Cobbett popularized the figurative usage, he was not the first to consider red herring for scenting hounds in a literal sense; an earlier reference occurs in the pamphlet Nashe's Lenten Stuffe, published in 1599 by the Elizabethan writer Thomas Nashe, in which he says "Next, to draw on hounds to a scent, to a red herring skin there is nothing comparable." The Oxford English Dictionary makes no connection with Nashe's quote and the figurative meaning of red herring to distract from the intended target, only in the literal sense of a hunting practice to draw dogs towards a scent. The use of herring to distract pursuing scent hounds was tested on Episode 148 of the series MythBusters. Although the hound used in the test stopped to eat the fish and lost the fugitive's scent temporarily, it eventually backtracked and located the target, resulting in the myth being classified by the show as "Busted". ^ a b c Oxford English Dictionary. red herring, n. Third edition, September 2009; online version December 2011. http://www.oed.com/view/Entry/160314; accessed 18 December 2011. An entry for this word was first included in the New English Dictionary, 1904. ^ Hurley, Patrick J. (2011). A Concise Introduction to Logic. Cengage Learning. pp. 131–133. ISBN 978-0-8400-3417-5. Archived from the original on 2017-02-22. ^ Tindale, Christopher W. (2007). Fallacies and Argument Appraisal. Cambridge University Press. pp. 28–33. ISBN 978-0-521-84208-2. ^ Niazi, Nozar (2010). How To Study Literature: Stylistic And Pragmatic Approaches. PHI Learning Pvt. Ltd. p. 142. ISBN 9788120340619. Archived from the original on 2013-10-09. Retrieved 2013-03-02. ^ Dupriez, Bernard Marie (1991). Dictionary of Literary Devices: Gradus, A-Z. Translated by Albert W. Halsall. University of Toronto Press. p. 322. ISBN 9780802068033. Archived from the original on 2013-10-09. Retrieved 2013-03-02. ^ Turco, Lewis (1999). The Book of Literary Terms: The Genres of Fiction, Drama, Nonfiction, Literary Criticism and Scholarship. UPNE. p. 143. ISBN 9780874519556. Archived from the original on 2013-10-09. Retrieved 2013-03-02. ^ haunt – Wiktionary defines haunt as a "place at which one is regularly found; a hangout", but it can also mean a "feeding place for animals", both senses would work here. ^ a b c d e f g h i j k l m Quinion, Michael (2002–2008). "The Lure of the Red Herring". World Wide Words. Archived from the original on November 4, 2010. Retrieved November 10, 2010. ^ Bibbesworth, Walter de (c. 1250) Femina Archived 2017-12-30 at the Wayback Machine Trinity College, Cambridge MS B.14.40. 27. Anglo-Norman On-Line Hub, 2005. ISBN 9780955212406. ^ Currall, J.E.P; Moss, M.S. ; Stuart, S.A.J. (2008). "Authenticity: a red herring?". Journal of Applied Logic. 6 (4): 534–544. doi:10.1016/j.jal.2008.09.004. ISSN 1570-8683. ^ Hendrickson, Robert (2000). The Facts on File Encyclopedia of Word and Phrase Origins. United States: Checkmark. ^ "Red herring", Oxford English Dictionary, Sense 2. ^ Nashe, Thomas (1599) Praise of the Red Herring Archived 2011-07-15 at the Wayback Machine In: William Oldys and John Malham (Eds) The Harleian miscellany Archived 2017-12-30 at the Wayback Machine Volume 2, Printed for R. Dutton, 1809. Page 331. This page was last edited on 9 March 2019, at 14:56 (UTC).